You may have noticed us frequently posting about these two dudes called Duke & Jones. Since their first release on Deadbeats, ‘Tusk’, they played the closing set at Deadbeats London and more recently released their EP, Dystopia. With support from some of the biggest DJs in the scene including Diplo, Zedd and DJ Pauly D, these two 22 year olds are quickly getting recognized for their talent. 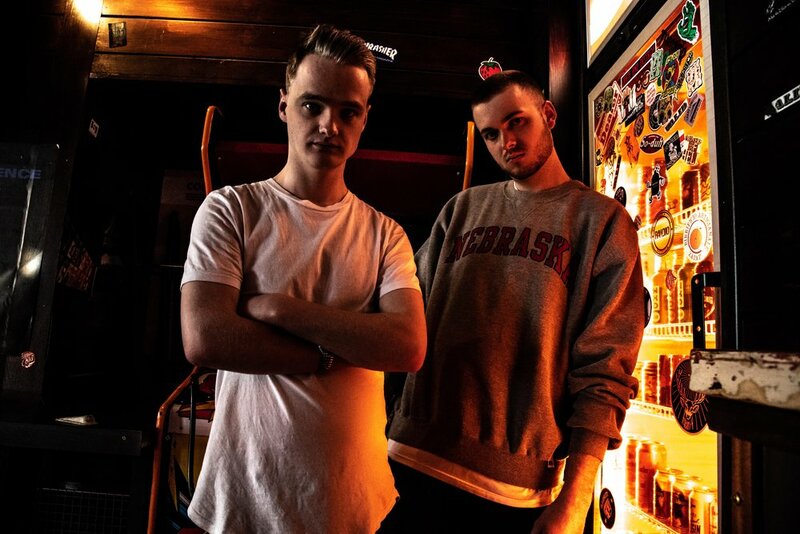 Both born and raised in Manchester, their style can be influenced by UK genres such as jungle, dubstep and grime as well as hip-hop, world music and house music. They constantly keep their music exciting and fresh and we are so stoked to have them in the Deadbeats fam! Read on to get to know Duke & Jones and listen to Dystopia EP, out now! Duke: Technically we met back in primary school but weirdly we didn’t actually chill together. It was only until I got dragged by my parents to Isaac’s house for 2008 New Year’s Eve. We discovered we had both separately been making awful hip hop beats, so we decided to spend the last day of the year working on our first duo project. I can safely say it never saw the light of day. Jones: It’s kinda funny because we pretty much owe Duke & Jones to our parents being friends! I don’t think he’d admit but I reckon Luke was pretty reluctant to spend New Year’s Eve at my house - until we discovered we had producing as a common interest. To be fair, it’s not that we didn’t know each-other before that, but we weren’t exactly close and I’m not sure we’d ever have had occasion to find out about the mutual interest in producing otherwise. What was the first song you ever heard that got you interested in producing? Duke: A classic U.K. Grime track called “P’s & Q’s” by Kano was the first track that I heard where the beat was just as important as the vocals. Me and a few friends in high school had a competition almost to see who could produce the best beats. From there it kind of snowballed and I would find myself in the school music room every spare break I had. Away from hip hop, Sub Focus was the first artist to properly open my eyes to dance music. Jones: I think I was initially into producing as an extension of trying to express myself through playing piano. I was okay at the piano but to be honest the attraction of Garageband was that you could go back and edit out the mistakes! I pretty quickly moved on from recording ambient stuff and I basically spent my early years trying to imitate Timbaland. I was especially a fan of the production on his more ballad-y stuff like Say It Right, and then I got into trying to make T.I. type beats. The first song that got me into making EDM was Seek Bromance, and generally the rest of Avicii’s work from that era. I’m sure a lot of people can say this but Until One by Swedish House Mafia was a revelation of an album for me as well. Do you prefer to be on-stage or in the studio? Duke: Hard question! I’d go with in the studio because that’s where I spend 6/7 days a week. But at the same time I’m so excited to play more and more shows. The feeling I got up on stage at Ministry of Sound was so special. Jones: For me, that depends on how well the production is going! Being on stage is consistently a lot of fun, and is definitely much better than spending 6 hours bashing keys in an uninspired studio session. However, nothing quite tops the feeling of knowing you’re making a banger, especially when you get to go and play it live after. What is the best part about living in Manchester? Duke: As far as cities go it’s actually not that busy! Life moves at a nice pace, it doesn’t feel like people are constantly rushing. As a huge football fan I couldn’t think of anywhere better to live. For anyone wondering... Manchester City. Jones: It’s got everything you need but you can still get across it in less than an hour, which makes it much better than London in my opinion. That and the fact that beer is a lot cheaper! What was your inspiration behind your latest EP, Dystopia? What does the word dystopia mean to you? Jones: Imagining the world of the EP as a dystopia, in a kind of desert-bit-in-blade-runner kind of way, is something I think all the songs can be fed into - RUST plays off that aesthetic, while Fade to Black and Nobody Else are titles/moods that both evoke an empty or desolate space or mood that wasn’t always that way. Closing the EP with Higher perhaps hints that things are going to improve again. Duke: it’s changed a lot of the years. Sub Focus, Diplo, DJ Snake are probably the main influences on our sound. Jones: Musically we kinda take inspiration from all over the place, but in terms of ‘models’ in a career path sense I’m really inspired by people who build a strong brand around them. I think the guy who kills it the most at that right now is San Holo. The graphic design, the music, the aesthetic of both his own stuff and bitbird - the way it all ties together is just top drawer in execution. What is a track that never gets old no matter how many times you hear it? Duke: Sub Focus - Out The Blue is one of my all-time favourite songs. It was one of the first tracks to give me goosebumps when hearing it live. Gimme More by Britney is highkey a banger. Jones: That would have to be Into You by Ariana Grande. It’s the best pop song of this decade, don’t @ me. I’ll also never get tired of the Wolfgang Gartner remix of Tiesto’s I Will Be Here, but Don’t You Worry Child has a special place in my heart - it still evokes the same pain of hearing SHM were splitting up!! What is your favourite candy or junk food? Jones: I’m gonna go very specific here and say my favourite junk food is the gravy from KFC. I can (and do) drink it on its own. I’m not really a candy guy but any chocolate which is milky and European goes down well. Stay away from me with that Hershey’s nonsense. Thank you Duke & Jones! Duke: Big thanks to Deadbeats for all the love!